One of the best chocolates in town. Cheap (less than Php10) but really good. Yummy! It reminds me of childhood when this was such a treat. We would be given this if we were well behaved. In my case, if I didn't show up at the house with a new wound or scratch from running around. It reminds me of my high school years. This was something my friends and I would share when we would chat. We'd talk of life dreams and how we would reach our goals. It reminds me now of how simple things can make you happy. It reminds me that yes, I may not be able to afford expensive chocolates now but you know what? 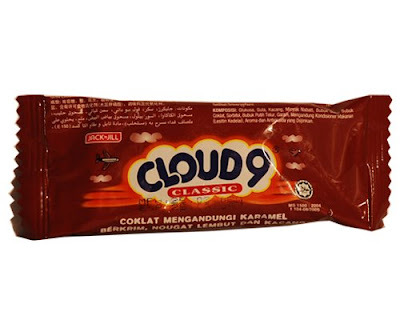 Cloud 9 is just the same as Cadbury but way cheaper. It reminds me to be creative and to appreciate what I still have and not long for what I no longer have. It reminds me that as long as I am alive, I can make life better ... for me, for my family, for my son. And in doing so, I can enjoy many more cloud 9's in the future.